Exciting times lie ahead for us and 3princessesand1dude! 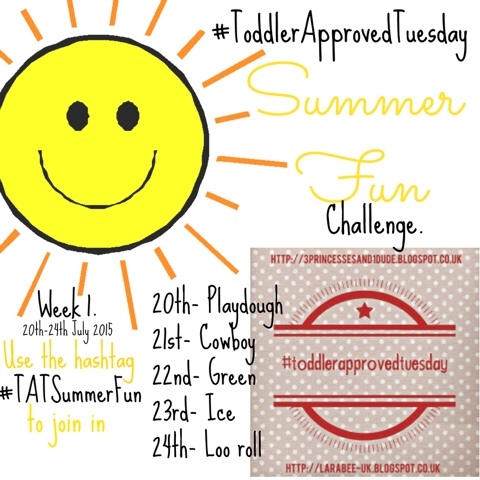 We are running a #toddlerapprovedtuesday activity and photo challenge. For anyone who has not participated in one before let me give you a little bit of info. Each Monday between 20 July and 31 August we will be revealing a list of play prompts for you to do with your littles. Each weekday has a different play prompt, you can keep it as simple or as elaborate as you like, this is not a linky and so is open to all, all you have to do is post a picture on Instagram or on our facebook page and add the hashtag, pictures of your set-up, child playing or end result of the prompt eg for play dough, you could post a picture of an invitation to create, or your child playing with playdough or a love sculpture your child has made, I'm sure you get the picture. Becky and I both find that children find bedtime easier and are more relaxed if they get some play time before their bedtime routine starts, we'll be doing this as our 'after nursery' activity although you can do yours whenever you like through the day. I'll be on the look out for some great, original ideas to share in my weekly posts and on facebook, so you never know, you may feature in my showcase! This week we thought we'd tempt you along with next weeks list, remember though the challenge doesn't start until Monday 20 July, we have so many friends who regularly do lovely activities with their littles and we cannot wait to see what you make of our prompts, who knows it might also inspire a blog post which could be linked up to #toddlerapprovedtuesday ! I say littles but there's no age range, I'm sure Ellie will get involved at some point over at 3peincessesand1dude and our teens will make an appearance I'm sure. All welcome! That's it until next week then! See you on Monday with your playdough pictures!